You can put a border around just one page if that page is at the beginning of a document or a section, such as a title page. If the page you want to add a border to is in the middle of your document, you must first add section breaks. Click Design > Page Borders. Under Setting on the left, choose the border style you want. If you want to remove a border, click None. Under Style, click the line style you want. Click the arrow under Color and choose a border color. Click the arrow under Width and choose the width you want. Tip: If you want a clip-art border instead, click the arrow under Art and choose a border graphic. Next, click the arrow to the right of Apply to and choose This section - First page only. 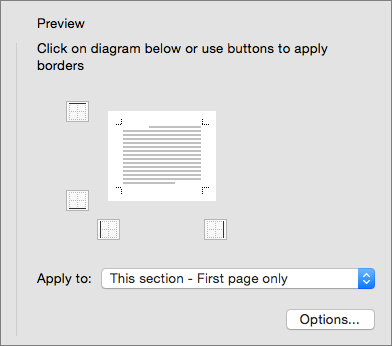 This setting also works if you’re adding the border to the first page in your document. The Preview box confirms your border styles. To remove the border from one side, click that line in the Preview box. 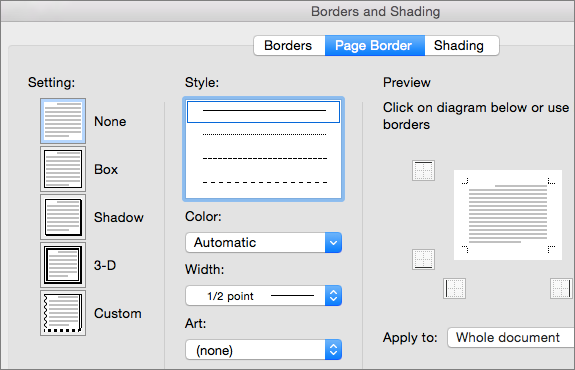 Tip: To change where the border appears on the page, click Options and adjust the margin settings. On the Layout tab, under Page Background, click Borders. Under Setting, click the setting that you want. On the Color pop-up menu, either click the color that you want, or mix your own color by clicking More Colors. On the Width pop-up menu, click a new border thickness. On the Style menu, click a new border style, such as a dashed line. On the Art pop-up menu, click the art that you want.